Home / Allgemein / Discover the Best Espresso Cups: Top Demitasse Comparison Guide! If you enjoy your espresso in the morning or after dinner, it should have the perfect aroma and temperature right? The best espresso cups, along with the best beans and perfect espresso machine make the difference. But obviously you care about your espresso since you are reading this. You do not want to use a normal demitasse; you want the best espresso cups to keep the aroma and high temperature to enjoy the Italian way of life. Espresso cups are small coffee cups called demitasse as well. A demitasse has 2–3 fl oz (60–90 ml) capacity — half the size of a full coffee pod (4 fl oz (120 ml)). Commonly they are made of thick porcelain and accompanied by matching saucers. Pretty new is to serve espresso in glass cups or shots. If you are an espresso lover you better avoid to fill your beloved espresso in a plastic cup, it deteriorates the aroma of the coffee and doesn`t keep it really hot for a longer time. The chart of top rated espresso coffee cups below will help you decide which espresso cups are perfect for you. Rating – Average user rating on Amazon.com This can be very helpful in deciding if people are satisfied with their purchase. Do you want to See Even More Porcelain Espresso Cups? Click Here to See Our Full List of nearly 20 Espresso cups. The coffee cups on this chart are only a small excerpt. There are so many designs and brands out there that there is no way that we could have listed all. BUT, there are many great coffee mugs with thick sides are included. Standard sizes of espresso cups? Espresso cups are available in different standard sizes for a variety of coffees. In the following you find the common capacity of coffee cups. What makes a perfect espresso cup? High quality espresso cups should have a thick side and are usually a bit heavier than other cups. If the porcelain is to thin the espresso cup holds the temperature only for a short time and the espresso will cool out very quickly – this is not a great way to enjoy espresso. The best way to have a great hot espresso is to warm up the espresso cup with the steam of the espresso machine or with hot water. This ensures that the demitasse has the same temperature as the espresso. A new trend to server espresso cups made out of glass. It makes it way better see the “Crema“ of the espresso. If you use glass cups, please be sure if it’s suitable for hot temperatures – normal glass can burst and the hot espresso could spill on your hands. 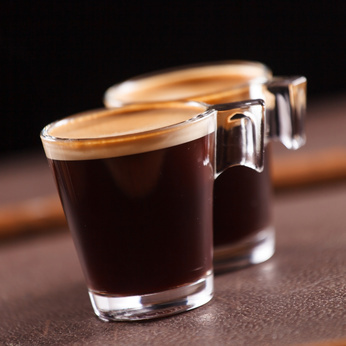 Do you want to See More Espresso Shot Glass? Click Here to See the list of Shot Glasses.